Based on the historically significant, if neglected, figure of Elizabethan Dr John Dee, Albarn and director Rufus Norris have created something of a spectacle, but even after the refinements that have been made, it remains something of a perplexing piece. 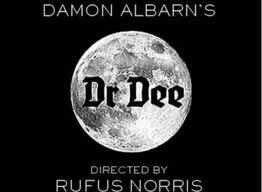 Dee’s biography reads as a thing of great fascination, a key advisor to Elizabeth I, he was a man whose extraordinary breadth of knowledge took in astrology, alchemy, philosophy, mathematics and much more besides but when this unquenchable thirst lead him to increasingly dabble in the occult, he sowed the seeds of his own downfall. But you would be hard-pressed to gather much of this from the events onstage. On the one hand, one could argue that this is a show less concerned with biographical detail and focused on providing a kind of pageant-based display. Norris’ staging works in some truly striking imagery and there are several moments of visual grace, especially in the astronomical sequence. But this doesn’t disguise the fact that it is simply perplexing for large swathes, something exacerbated by a lack of lyrical clarity (and the baffling decision not to have surtitles), the basic thread of storytelling thus ever-elusive throughout. And though much of the staging is cleverly done, there’s a little too much recycling of ideas which becomes somewhat exasperating by the end. Musically, it remains an interesting panoply of varied influences, some operatic, some not so much, played with skill by the band on their raised stage, led by Albarn’s troubadour narrator figure. Though this role has been slimmed a little, it still rankles with me rather, feeling more like an ego-trip than a strictly necessary part of this show particularly in his decision to give himself the final self-aggrandising piece of commentary and song. Hand in hand with this is a beefing up of the role of Dee himself who now has more of a (singing) voice, which in itself is perverse as Bertie Carvel who played the role, and was disappointingly under-utilised, in Manchester has now been replaced by Paul Hilton. The cast do what they can but it has to be said that the acting is not necessarily a strong point to Dr Dee.